High Quality Content by WIKIPEDIA articles! Rade ín is a village and municipality (obec) in ár nad Sázavou District in the Vyso ina Region of the Czech Republic. The municipality covers an area of 3.75 square kilometres (1.45 sq mi), and has a population of 111 (as at 28 August 2006). Rade ín lies approximately 16 kilometres (10 mi) south-east of ár nad Sázavou, 37 km (23 mi) east of Jihlava, and 138 km (86 mi) south-east of Prague. ár nad Sázavou District (Okres ár nad Sázavou in Czech) is a district (okres) within the Vyso ina Region (Vyso ina) of the Czech Republic. Its capital is ár nad Sázavou, a town of 24.000 inhabitants built on the river Sázava. 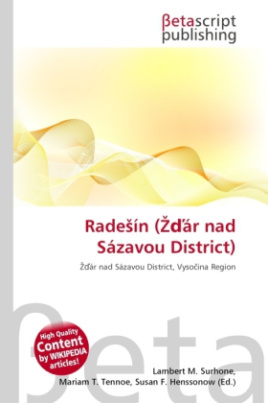 The district's landscape is very pictoresque, consisting of a highland of rolling hills around the rivers Sázava, Oslava, Svratka and Chrudimka, covered by deep forests, lakes and fields.